The Parvin Road Covered Bridge that spans Lost Creek in Lane County Oregon was originally built in 1921 for $3600.00, replacing the original bridge that had been erected in the 1880’s. 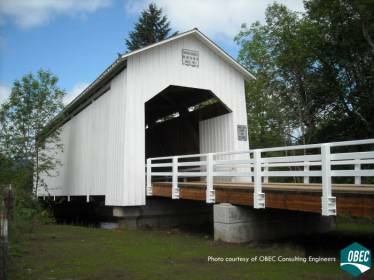 This 75 foot Howe Truss bridge is one of 50 covered bridges in the state of Oregon. In the mid 1970’s the bridge was bypassed due to highway realignment and restricted to pedestrian traffic only. In 1986, the bridge was reopened to vehicular traffic and dedicated to the Parvin family which homesteaded the area in the mid 1800’s. It has since been added to the National Register of Historic Places. Portland Bolt was called upon to manufacture 1-3/8” and 1-3/4” x 20+ foot, high strength rods to reinforce the bridge. We also fabricated ½” and 3/4” galvanized lag screws with domestic steel to provide full certification documents. Although this was a county project, not an ODOT job, the county required all fasteners and hardware be 100% melted and manufactured in the United States. With Portland Bolt’s large inventory of domestic nuts and round bar, we were able to provide material to the job site in two weeks accompanied with clear and concise mill test reports via automatically generated emails that were quickly signed off on and kept the job moving on time.